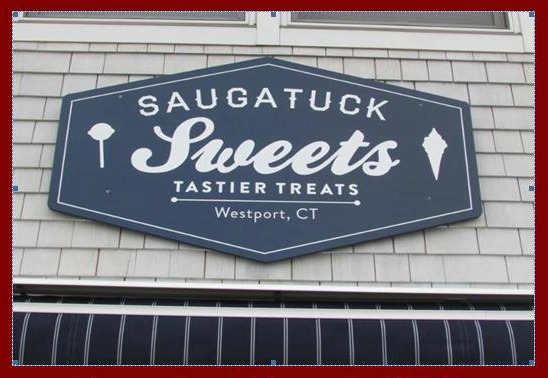 Saugatuck Sweets has its official, grand opening, ribbon-cutting ceremony on Saturday, May 3 (12 noon). What? You heard rumors already? What makes this a “scoop”? Well, Saugatuck Sweets is that neighborhood’s newest (and only) ice cream shop. Sure, they also sell high-quality desserts, yogurt and great candy. But you can’t make those into clever headlines. Saugatuck Center is Westport’s hot new neighborhood. Ice cream from Saugatuck Sweets will be the perfect way to chill. This entry was posted in Local business, Restaurants, Saugatuck and tagged Saugatuck Sweets, The Whelk. Bookmark the permalink.